Agile Dauntless SDB RootBeer! Whole lotta Les Paul for $250! This is my Agile Dauntless RootBeer Les Paul copy that I got from RondoMusic for $270/shipped! Boy, oh boy you gotta love the Agile line from Rondo! This freaking thing is gorgeous and has the features of Gibson that would be about $800. The Epiphone equivalent to this is about $600. 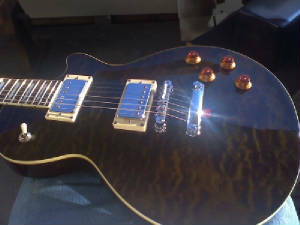 I have never owned in LP copy, and basically I was looking for something as low as possible in price, but as close to an actual Les Paul as you can get in the "cheap zone". I wanted to see what the LP experience was "all about". I had an idea what it was about based on the fact that some of my most favorite bands, musicaions, artist use Les Pauls; Boston, Peter Frampton, Queensryche, Ace Frehley from Kiss, and so many more. They all had really good hard rock sounds, so I thought; well there must be something to that! So looking at ROndomusic.com, you can see they have some awesome deals there on all kinds of guitars, including LP copies. The entry level LP copy then I believe was about $150 (they have some right now starting at $120). Now those look like some ok guitars, but they have a bolt on neck, which is not true to an LP, you want a set neck for more sustain. If you only have less than $200 to spend, there is nothing wrong with these bolt-on neck LP copy guitars. Anyway, going up in price to about $250 they had the AL-2000, whcich of the set neck and some other nice upgrades over those lower priced SX and Johnson LP copies. Also for about $20 more, you could get the Agile Dauntless, which is a slight upgrade from the AL-2000, in that it has a graphite nut instead of plastic (worthy upgrade), Duncan Designed pickups, and maybe one or two other things. To top it off, the RootBeer finished Dauntless was on sale for like $249! So it was the same as the AL-2000 for this one. So I jumped on it. Arrived quickly, in great shape. No flaws in the finish whatsoever. It was setup so-so, and I still have been playing it the way it was out of the box except tuning of course, but same strings and still I have not done the setup. And it plays pretty nice like this. I am sure a setup would make a substantial difference. But it's nice getting such a fantastic instrument that can even play without a setup for $270/shipped. THe bottom line is I highly recomend this guitar to anyone that is considering a Gibson Les Paul, Epiphone, or any other LP copy. If you are looking for something in the under $500 segment, you can get 2 of these in the finsh of your choice! Now check out the Root Beer pics!